Softcover books — paperbacks — play a vital, though sometimes underappreciated, role in library service. The lower cost of softcover books can help a library provide more total resources by stretching the budget a bit and many excellent works are initially published in softcover form in order to reduce the cost of publication. The Achilles’ heel of softcover materials is their durability. If they are allowed to wear and become unusable (or simply unattractive) prematurely, the initial cost savings will be erased. There exists a wide variety of products designed to protect softcover materials and extend their useful life. This post will deal with several offered by Demco as those are most familiar to me. Mil: The measurement of the thickness of the plastic film in the protecting material. One mil is 1/1,000 (0.001) of an inch. The film in protecting material sold by Demco ranges from 2 to 15 mils. Polyester vs. polypropylene vs. vinyl: All are types of plastic film, but polyester is much stronger than polypropylene or vinyl. Only polyester and polypropylene are safe for archival materials. Most of Demco’s covers are made from top-quality polyester. Vinyl is not a stable material since chemicals will migrate into other materials as the vinyl becomes brittle. Although lower-cost covering products made from vinyl are available, I do not recommend their use on materials you hope to protect for an extended period of time. Repositionable adhesive: The adhesive in the covering material does not form a permanent bond for several hours after application. This is intended to allow the user to carefully lift the covering material, if necessary, and reapply it to eliminate creases or air bubbles. All CircExtender® products use repositionable adhesive. Acid-free or pH neutral: Any acidic material in contact with paper will cause the paper to discolor and deteriorate. 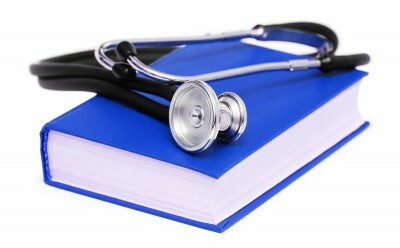 Any material used to protect softcover books should be acid-free and chemically stable. For more information on the pH of materials, refer to my Book Repair Supplies and Materials blog post. All the products that Demco sells for protecting books are acid-free. 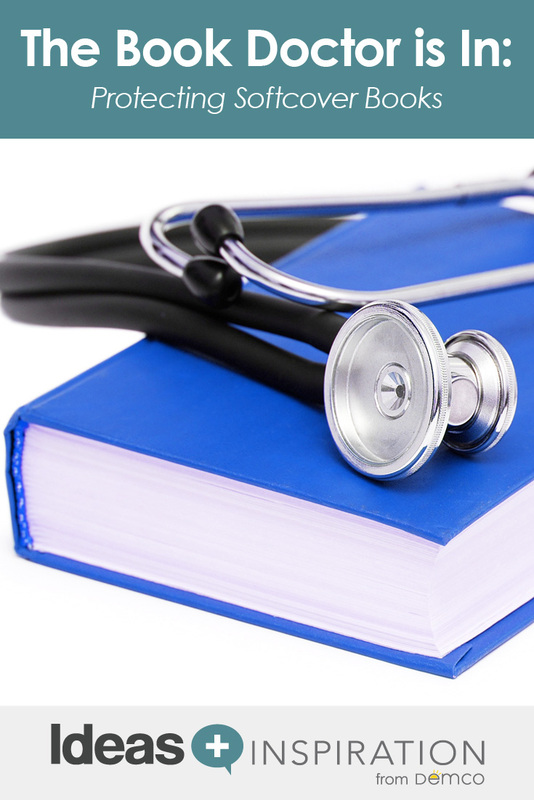 The products you select to protect specific softcover books will depend upon the value of the book, the amount of use you anticipate it will receive and how long you expect it to remain in your collection. Mass-market paperbacks are generally the lowest-cost books you will buy and you may wish to discard them after several circulations. Many librarians simply reinforce the weakest area of these books — the corner where the covers attach to the spine — with a durable clear tape, such as Demco Crystal Clear Book Tape. I strongly recommend that you use a Demco® C-27 Taping System Applicator, which greatly speeds up the process and eliminates taping errors. 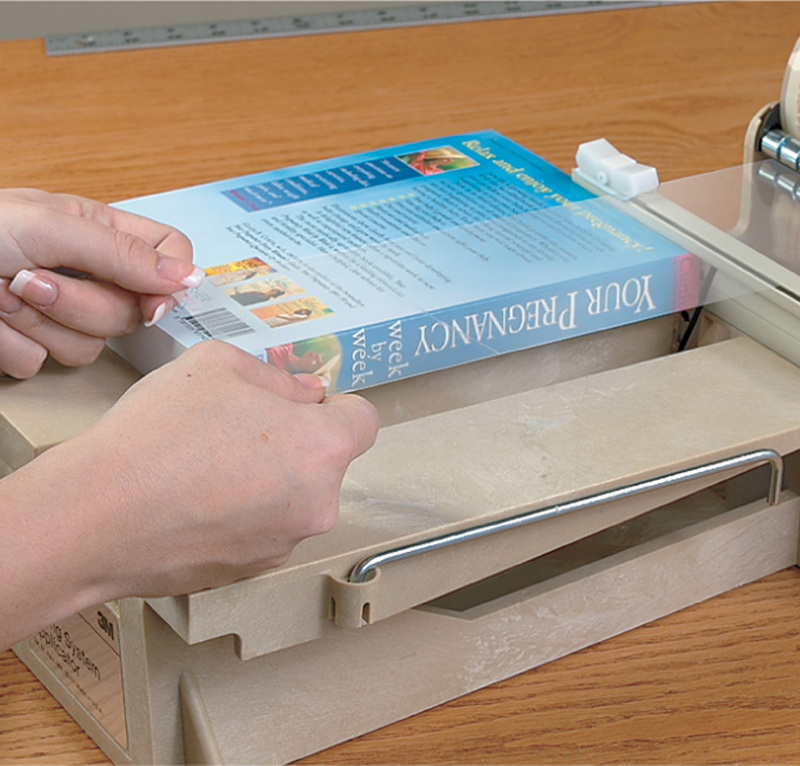 Depress the platform and slide the book under the cutter lip with the spine facing right. 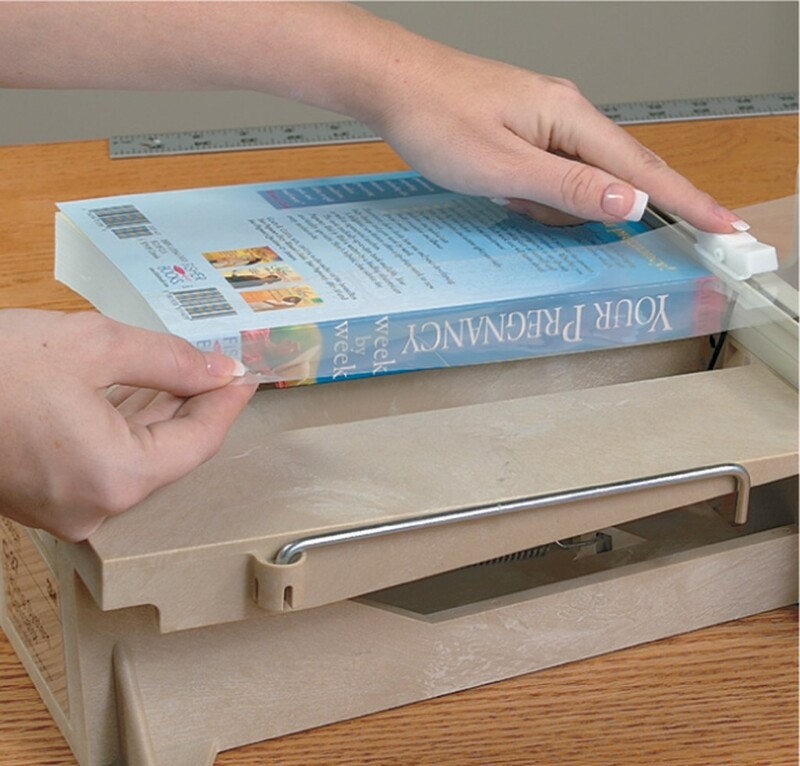 (The outriggers can be extended to support large books.) Line up the lower corner of the book's spine on the spine guide. Pull the tape out to the end of the book cover and line up the edge of the tape parallel with the spine. 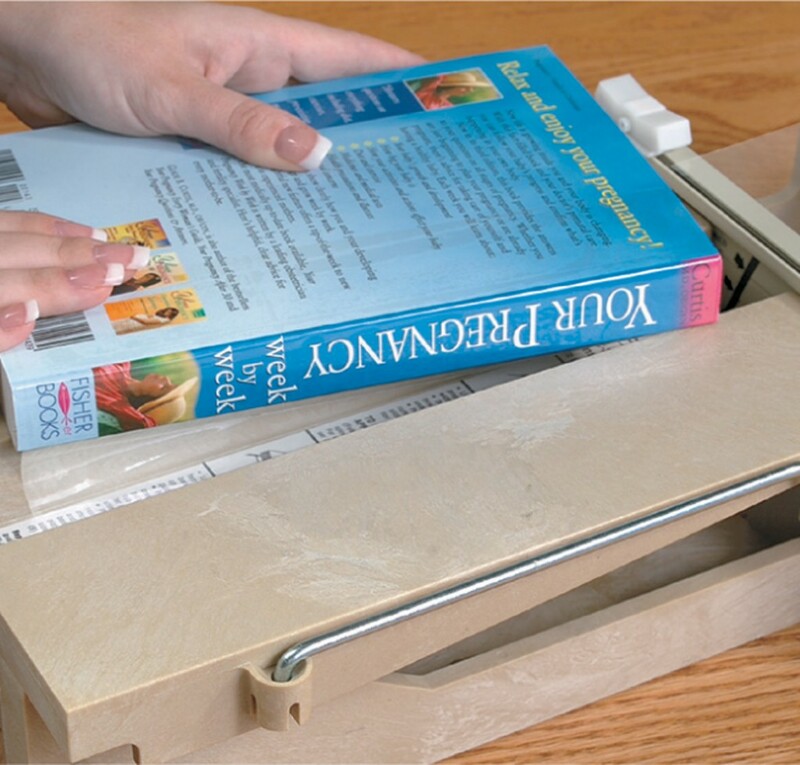 Press the tape down on the book and slide the cutter to trim the tape. Press the book down and slide it toward you. Demco offers a wide variety of laminates designed to meet different needs. All are sold in rolls with a printed grid on the backing paper to aid in accurate cutting, and adhesive allows repositioning up to 24 hours. Applying rolled laminate can be a bit tricky until you get the hang of it, but the following steps make it easy. 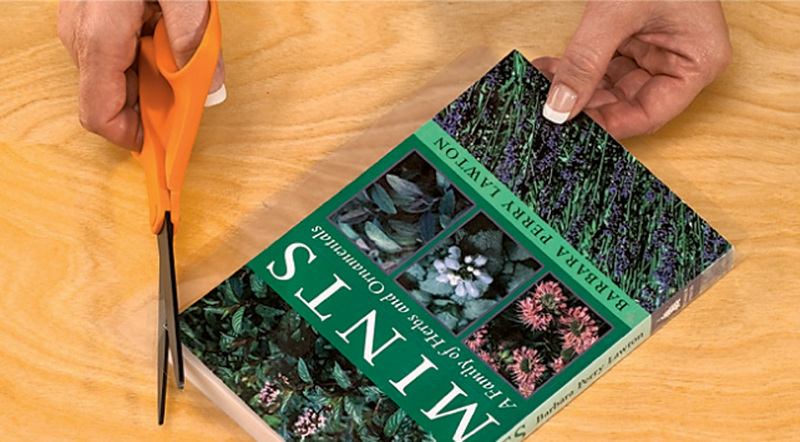 Lay the open paperback on the Demco® Laminate and cut to size, leaving approximately 1" around the edges. Remove the liner paper by peeling away at the split. Lay the laminate on a flat surface, adhesive side up. Center the spine of the book on the laminate. 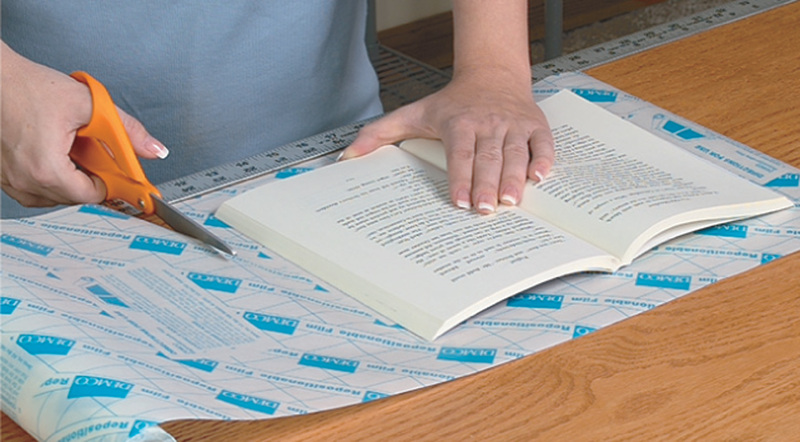 Roll the book first to one side of the laminate and then the other. Smooth gently with a bone folder to eliminate air bubbles. Cut away the corners of the laminate at a 45º angle. Also slit the laminate at the corners of the spine at a 45º angle. Fold the overlapping laminate around the book edge or material and secure to inside of the covers. Trim off the remaining center tabs at the spine. Choosing your preferred style of cover may involve a bit of trial and error, and you will likely find that some styles are best for some applications and other styles work better for different materials. The chart below provides an overview of what is available along with links to where you will find additional information about each style. The corners and spine have been trimmed on pre-cut covers to minimize measuring and cutting and make them the easiest to use. The 5 mil front and back covers provide outstanding protection for larger books while the material in the spine area is 2 mils thick to retain flexibility. 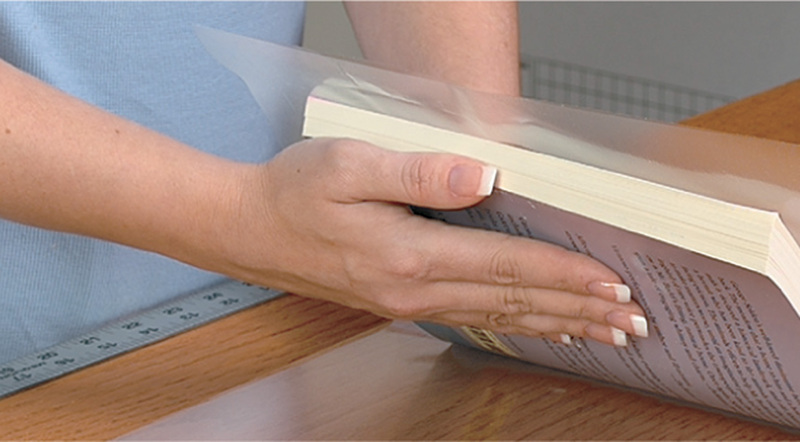 Use 15 mil polyester front and back covers to support your oversized softcover books. The spine has 2 mil thickness to retain flexibility. No matter which cover you choose, application is quick and easy. Instructions are included in every package. 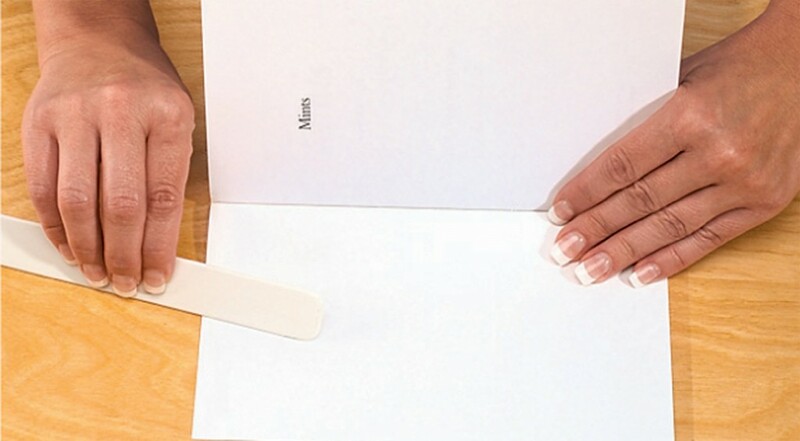 Remove the center strip liner paper and position the spine of the book onto the exposed adhesive. 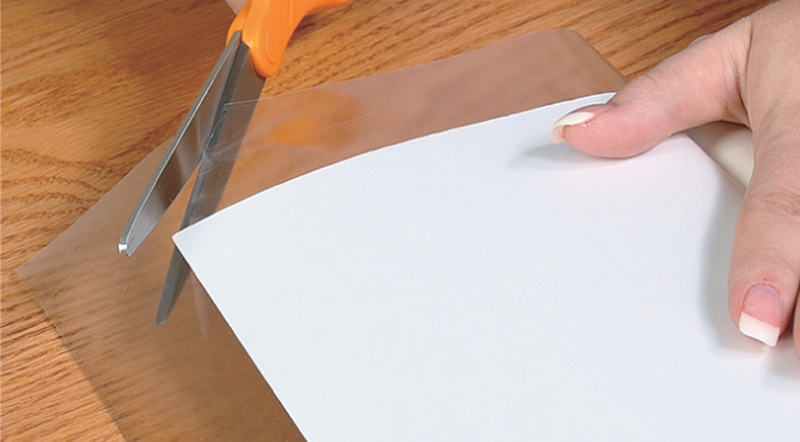 Note: For precuts without a center strip liner, remove one side of liner paper and roll book onto adhesive. 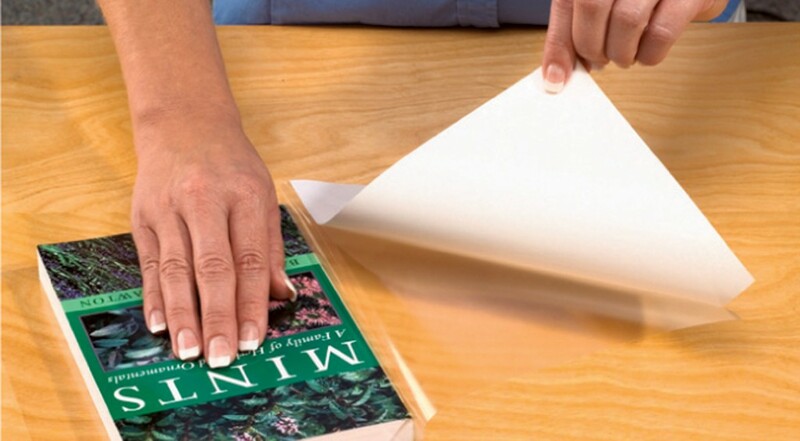 Remove one side of the liner paper and roll the book onto the exposed adhesive. Repeat for the other side. Use a bone folder to gently smooth out any air bubbles. For 2.5–5-mil material, cut away the corners at a 45º angle. For 7-mil material or thicker, you will want to trim off excess along the book edge. 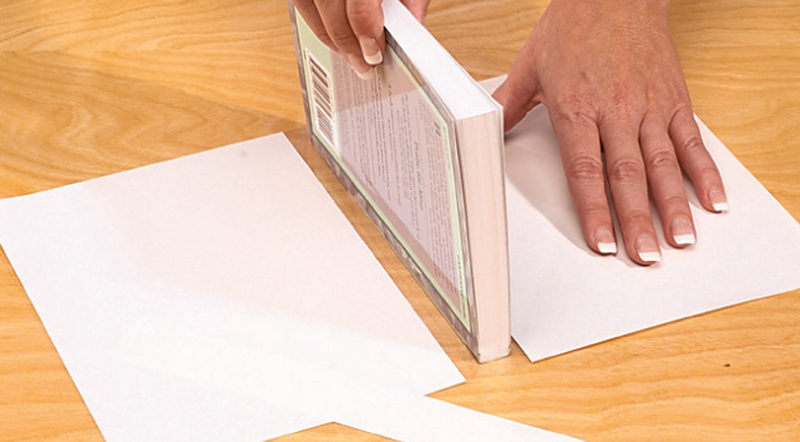 Fold the excess material over the book cover and smooth with a bone folder. For more help, refer to two resources from Demco. The Demco Collection Care Guide and the Demco Collection Care DVD are both available to help you through your book repair and protection challenges. Many of our older reference books in our high school library have a plastic “finger hook” attached to the top of the spine. It assists when students want to pull a book off the shelves. They simply place a finger inside the “hook” and pull, thus protecting the book’s end cap. Do you know what these “finger hooks” are called? They are clear. They adhere to the book’s cover front and back at the top, but the “hook” part is plastic and not sticky. I am hoping to find more of these to add to some of our older reference books, but I do not know what they are called. Any ideas? I checked with John Ison, and he was unfamiliar with this product. However, our product manager will look into it, as it sounds like a neat idea! John also mentioned that clear plastic book wings can offer a lot of protection against torn head caps caused by pulling the books off the shelf. Did I miss the link on how to purchase? You should be able to click on the product links in the tables above to get to any of the products you’re interested in. Thanks for your interest! Can you kindly recommend which products are best for children’s (heavily used, often thinner and larger) softcover books? I was grateful for the recommendation in the related hardcover post. Thank you kindly! Children’s books as you describe often benefit from the support provided by Demco CircExtender Semi-rigid Covers. These covers are 5-mil polyester for added support with 2-mil spines for flexibility. They are available for books up to 13 inches high and will fit a wide variety of thicknesses. For the largest books which may need maximum support I recommend Demco CircExtender Rigid Cover IV as the 15-mil polyester will keep them upright while shelved and protect them from bending during use. As with Semi-rigid covers these have a 2-mil spine to allow the book to open easily and are available for books up to 13 inches high. You will find links to both of these products in the chart above. Thanks for your interest and please contact us again if you have further questions. It was much easier for individual paperback owners when high quality covers were available (in quantities of one or two, depending on their dimensions) at stores like Barnes and Noble. Can one only purchase them now in high quantities through library suppliers? We do have some slip-on bookcovers that can be purchased individually to protect your books. I hope they meet your needs; thanks for reading!